A new multi-purpose three-in-one chaser bin is already turning heads as it increases productivity and offers year-round flexibility. 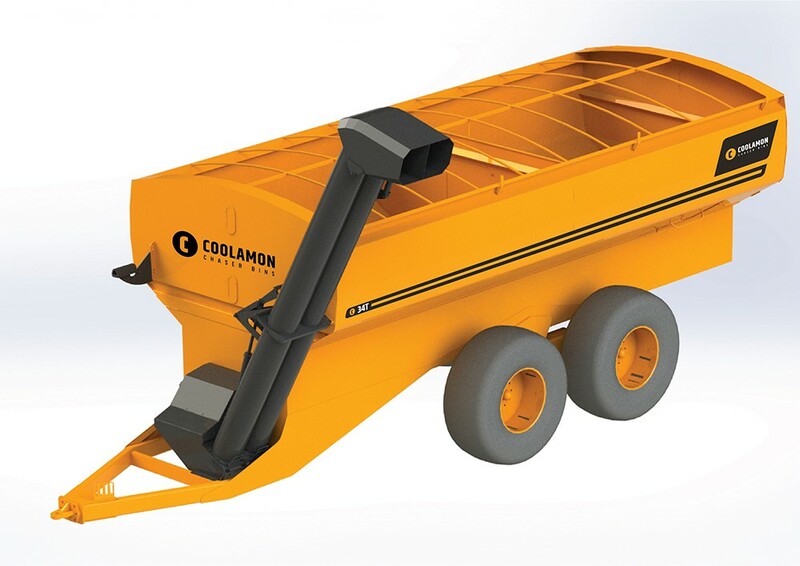 The Coolamon All Rounder is a world first combination of a chaser bin, seed and super grouper and fertilizer spreader. Coolamon Chaser Bins general manager Heath Hutcheon said the All Rounder was a multi-purpose machine designed for year round use. “The All Rounder functions as a chaser bin at harvest time, a seed-super unit at sowing time and a fertilizer spreader throughout the year,’’ Mr Hutcheon said. “The All Rounder effectively replaces two other machines in the machinery shed. “It decreases capital expenditure and cuts operating costs due to hiring machines or paying contractors. “The large volume spreading option allows growers to increase production. Available in 22, 28, 34 and 40 tonne models, the All Rounder will be publicly debuted at the Henty Machinery Field Days on September 19-21. Designed and manufactured in the Riverina, the All Rounder is an entry in the coveted Henty Machine of the Year Award. “In this machine and everything we design, we are always looking to the market and what farmers want us to deliver,’’ Mr Hutcheon said. At harvest, the bin functions as a fully hydraulically operated chaser bin, with a large dropper box to transfer grain from the conveyor belt to the dual delivery augers. The All Rounder is equipped dual 14’’ unloading augers, and a 800mm wide troughed conveyor belt. The conveyor belt acts as a cross auger, reducing damage to lupins and chickpeas. The spreader is powered by Haze Ag patented 600mm twin spinners, feeding out via a rear hopper with a horizontal variable gate for accurate rates. The cast iron, curved back spinner blades give a controlled spread of up to 36m with urea, with no damage to product. “We have partnered with Richard Hazelton from Haze Ag as we see synergies in our products that are both leading edge and ahead of the industry,’’ Mr Hutcheon said. He pointed to auger visibility problems from the tractor cab and slow unloading speeds in existing seed-super units. “Our two main challenges were keeping it a seed-super unit that also acted as a chaser bin with a faster unloading rate,’’ he said. Key to the seed and super unit is the hydraulically operated diverter plate allowing the operator to switch between seed and super without causing contamination. The diverter plate is then removed to create a normal chaser bin with a fast unloading rate. Growers will be able to inspect the All Rounder at the Henty Machinery Field Days with the track undercarriage system option. The tracks reduce ground pressure between 60 and 70 per cent when compared to traditional tyre systems, and maximize ground contact and support over uneven terrain. The rear steering option creates a tight turning circle, reducing damage to laneways and paddocks caused by dragging fixed wheels. The All Rounder has a transport width of under 3.5 metres. “Like the rest of our range of chaser, field and mother bins, the All Rounder is of the highest durability and reliability,’’ Mr Hutcheon said. Coolamon Chaser Bins is planning demonstration days throughout the country to showcase the All Rounder’s capabilities.